Kang Chol-hwan, co-author of The Aquariums of Pyongyang: Ten Years in the North Korean Gulag, founded the non-partisan think-tank North Korea Strategy Center (NKSC) in 2007. Through the raising of awareness, leadership development, research and the dissemination of information, NKSC aims to promote action on issues related to North Korea based on the principles of freedom of expression and freedom of information. Programs that NKSC undertakes include: sending USB sticks, DVDs, and radios into North Korea in an effort to increase the flow of information within its borders; publishing Eyes of Pyongyang, a magazine featuring the voices of North Korean defectors; and training North Korean defectors to become journalists. Sharon Stratton is the U.S. program officer for NKSC. Based in New York, she manages U.S.-based projects while leading relationship-building, development and overall wider awareness of NKSC and its mission. 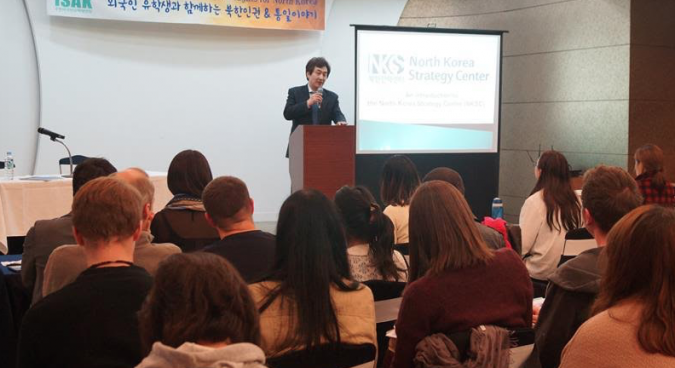 With the help of the South Korean Ministry of Unification Stratton, along with several other NKSC staff, toured the United States with NK defectors in February 2015 for various speaking engagements at various universities and organizations, including Tufts University, Boston University, Harvard, Yale, Columbia, Georgetown and the Johns Hopkins University School of Advanced International Studies. Stratton told NK News that a great deal of support for NKSC and its programs and activities come from the United States, particularly from American college students. 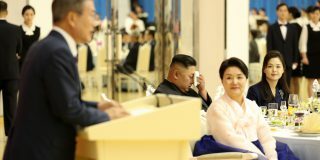 Additionally, while there has been great progress in effectively disseminating information within North Korea, there is still significant need for technological research and development to develop technology that addresses the needs of the majority of ordinary North Koreans who cannot freely access independent information, lack access to the internet, and, if they do have computers or other hardware, the technology they do have is likely outdated with limited capacity. NK News: NKSC has sent in thousands of USB sticks containing outside media into North Korea. How effective have they been in increasing the flow of outside information within North Korea’s borders? Stratton: By virtue of the North Korean regime’s oppressive, strict control over information available to citizens, disseminating USBs has been effective in increasing the flow of foreign information into North Korea. Ultimately, because of the dearth of non-state-generated information in the country, this outside information and media would not be available if international groups were not making deliberate efforts to send it into North Korea. Of course, there are significant challenges in measuring effectiveness; it is difficult to know, for example, with exact certainty who and how many people are encountering the USBs being sent in, as well as precisely which locations USBs are reaching within the country. NKSC works with trusted partners in the field who are able to conduct interviews in North Korea and on the China-North Korea border regions. Through these interviews, NKSC can gauge the conditions in the country regarding responses to foreign media accessed via USBs. One of the most referenced indicators of the effectiveness of these information campaigns (sending USBs and foreign media) is testimonies from North Korean defectors. So many defectors who resettle in South Korea recall having learnt for the first time about aspects of the world outside of North Korea after having encountered a foreign TV show, radio broadcast or movie. We know from a combination of defector testimonies and feedback from our partners in the field that access to foreign media within North Korea is increasing, as is the popularity and desire for certain kinds of media and preferences for particular genres and shows. NK News: Have there ever been any situations in which smugglers were apprehended with these USB sticks and other devices? What does NKSC do in such an event? Stratton: NKSC has not been apprehended on the border or when directly engaged in any distribution activity. USBs are concealed in various ways amongst existing trade goods, so that they move across the border alongside other official and unofficial trade networks. Moreover, over the past seven years, NKSC has established a network based on long-lasting relationships of mutual trust. Our local partners range from businessmen to border patrol, and we have cooperation on both sides of the China-North Korea border in all aspects of our campaign. NK News: Earlier this year, you and several members of NKSC came to the United States on a speaking tour with support from South Korea’s Ministry of Reunification. How did this tour get established? What have the responses among attendees been like? Is there widespread support among American college students? Stratton: We were supported by South Korea’s Ministry of Unification (MoU) through NKSC’s international youth engagement initiative, Woorihana, which focuses specifically on projects engaging youth around North Korean human rights issues and awareness-raising. MoU recognizes the importance of engaging in discussion with students on issues surrounding North Korea, and as we have a long history of working with MoU running programs to bring together defectors and international students in South Korea, it made sense for us to bring Woorihana to the U.S. Other examples of our past collaboration with MoU include our speaker series, mentoring and cultural exchange programs in elementary, middle and high schools as well as camps. NKSC have always had a huge amount of support and interest from individuals and organizations in the U.S., with a particular enthusiasm from U.S. college students to learn about our work and ways to contribute. We have a high number of U.S. college students who intern and volunteer at our Seoul office. So for the Woorihana speaking tour, we partnered with colleges that had active North Korean human rights students groups who were eager to host us for an event at their college. We presented at Tufts Fletcher School of Diplomacy, Boston University, Harvard, Yale, Columbia, Georgetown and the Johns Hopkins University School of Advanced International Studies and were so encouraged by the overwhelmingly positive feedback at each event. Most students had either little or no knowledge of human rights conditions in North Korea, and had never met a North Korean defector. We wanted students to have the opportunity to meet and share conversations with defectors, to share cultural exchange, and to have person-to-person interactions while learning about conditions in North Korea and the very real, human impact of such conditions. North Korea cannot be marginalized by narrow emphases on its mass games, nuclear tests and an autocratic Supreme Leader with a fondness for the NBA. We believe it’s important that students are able to find a deeper understanding of what the country is like for the majority of the population and demystify some of the stereotypes that are applied to North Koreans generally. Central to our discussion at these events was the importance of increasing access to information within North Korea as a strategy to empower citizens with knowledge and resources in order to encourage independent, critical thinking. 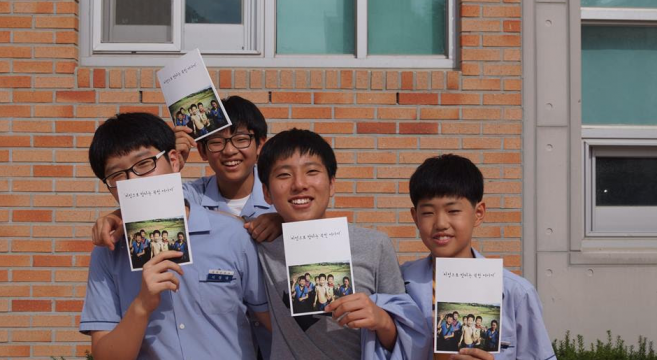 South Korean students pictured with the “Eyes of Pyongyang” publication. Rather than suggest that we should expect change in North Korea to come from outside the country, we discussed the importance of supporting and empowering North Korean people to want to initiate changes for themselves. To do this, North Koreans need independent information to provide context that allows them to reflect critically on their own country and government. NKSC believes that independent thought, freedom to participate in political and civil life, and the freedom to disagree with your government without fear of persecution are the cornerstones of a strong, democratic society. North Koreans should also be able to realize these freedoms. 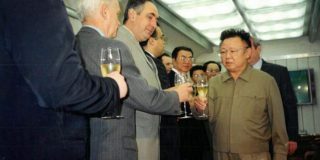 The idea of empowerment of ordinary North Koreans seemed to be a perspective that a lot of students hadn’t encountered in their studies on approaches to North Korea, with many expressing that that they found ideas of self-determination and empowerment through information for North Koreans compelling. NK News: Has NKSC received any official response from the North Korean government for its programs and activities? Stratton: No, NKSC has not received any official response, given that our headquarters are based in Seoul and North Korea do not have formal, direct diplomatic ties with South Korea. However, the North Korean government does make its general opposition to foreign media and information, as well as the severity of punishment for North Koreans accessing this information, very well known through state propaganda. NK News: Can you tell us about some of the outcomes for NKSC’s programs? For example, the journalist training program for defectors, and sending foreign media into North Korea. Stratton: NKSC take great care to send content that will be amenable to North Koreans based on focus groups that we carry out regularly with defectors and our field partners where we place foremost feedback from within North Korea about what kind of content is in demand. As well as entertainment (South Korean dramas are particularly popular), NKSC prioritizes sending informative, educational and inspiring content that takes into consideration cultural and social modes in North Korea, whilst sharing insights about the world outside the country and alternate social, political and economic realities. We really take seriously the quality and potential impact of content that we distribute into North Korea. With regards to the outcomes of our other programs, all of our programs and activities fall under our four organization strategies – raising awareness, leadership development, information dissemination and research, so each has different outcomes. As you’ve mentioned, NKSC ran a program in Seoul called journalist academy (JA) between 2011-2014, involving a total of nearly 200 college-aged defectors resettled in South Korea. JA was a part of our leadership development strategy, and aimed to cultivate journalists with a North Korean background by providing training in critical writing and communications skills through structured theoretical and practical training, including workshops and having their writings published. A couple of our JA participants were actually contributors to NK News, through the Ask a North Korean section. Defectors play an important role as voices on issues pertaining to North Korea, so NKSC saw the need to ensure that young defectors were supported to communicate critically through their published written work. We had agreements with media outlets (e.g. Chosun Ilbo, the Daily NK, Independent Times and the Yonhap News Agency) who provided internships for JA participants, to add to their professional learning experience. So, as well as having their pieces published through various online media outlets, extended training was offered for participants to be involved in the project “Eyes of Pyongyang” – a photographic essay series that incorporated personal photos from defectors with reflections on their lives in North Korea. 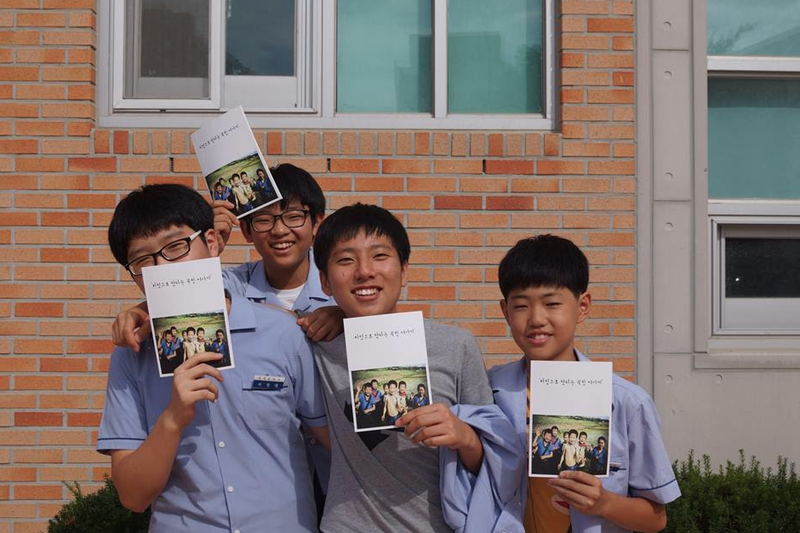 Further, students who successfully completed the JA program were eligible to be speakers for the unification education program (which falls under our leadership development strategy), where young defectors visit primary and secondary schools throughout South Korea to talk about their personal experiences in North Korea and open up the discussion to unification. NKSC conduct a lot of activities under our raising awareness strategy, including our speaker series run in Seoul that aims to engage the English-speaking community with North Korea experts and defectors for informative subject-specific presentations; speaking tours in the U.S. and Canada, that reach out to students and young professionals; and participation in international seminars that deal with a range of North Korea-related issues. Finally, NKSC also carries out research that utilizes our networks in China, South Korea and North Korea to provide up-to-date and critical primary information and insights on North Korea. NKSC conducted a study into the labor conditions of state-designated overseas North Korean laborers in Russia, China, Kaesong Industrial Complex and Kuwait that provided an analysis of the exploitative nature of just one of North Korea’s foreign currency-earning operations. Other research has included, but is not limited to, an analysis of the IT infrastructure landscape in North Korea, and responses to foreign media in North Korea. NK News: What are NKSC’s ultimate end goals? How will NKSC measure whether it has achieved these goals? Stratton: NKSC’s ultimate objective is to see a North Korea that protects, fosters and governs in the interest of its people, under a democratic government that respects fundamental human rights. We envision a North Korea where the people themselves will initiate progress and change based on their own self-determination. As we’re not in a position to be able to interview people directly in North Korea, we gauge our progress towards this vision by monitoring reactions through our information dissemination campaigns and research in the defector community. Reports that we receive confirming increased access to and desire for foreign content is one positive indicator that North Koreans have a desire to learn outside of what their government is dictating; feedback that we receive from North Korean residents is one of our most important evaluators. 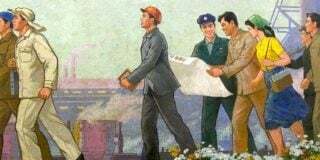 NK News: Can you tell us a little more about what you think about current campaigns to spread outside information in North Korea? What has been done well? What could be improved? Stratton: As proponents of the principle that more access to independent, outside information is a positive for North Koreans, we support campaigns that aim to do this in a manner most effective and safe (as possible) for North Koreans. In terms of areas where there could be improvement – there is a great need for R&D to innovate new technology that adequately addresses certain challenging factors: minimizing physical risk of being discovered by authorities, devices that are not reliant on internet (given the lack of access for ordinary North Koreans), and need for significant memory capacity. North Korea presents complex and somewhat unique challenges in terms of how we share our world of information with the country, and greater cooperation between organizations that have experience in distribution of foreign media into North Korea and innovative technologists, is certainly an area that we believe could be improved. For these efforts, we welcome organizations and individuals who are interested in our work to contact us with ideas on cooperation. Subscribe to read the remaining 2358 words of this article.